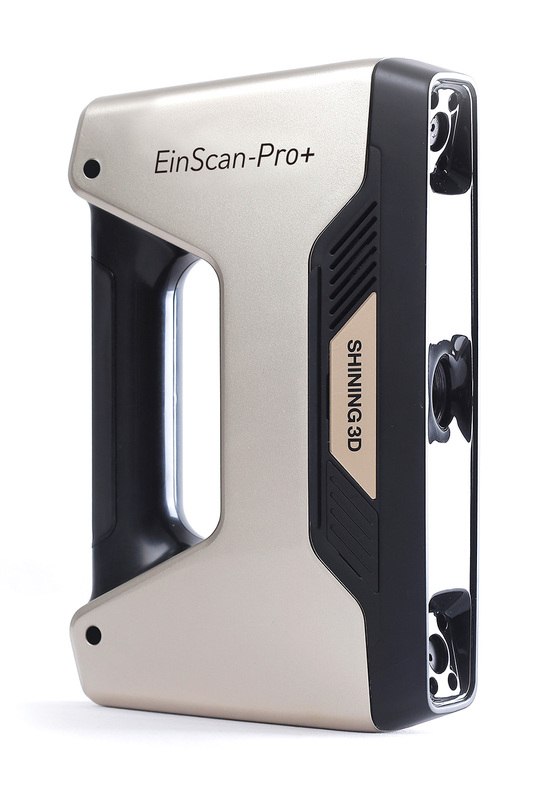 The EinScan-Pro+ carries on the consistent excellent scanning quality of the EinScan-Pro. 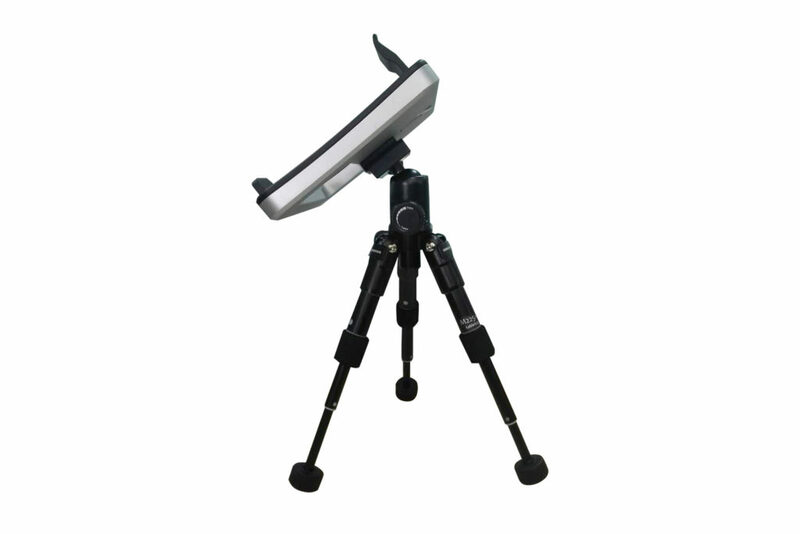 It provides multiple scanning modes and delivers simple and fast scanning with its convenient handheld design. 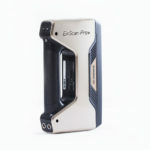 The new EinScan-Pro+, offers a brighter and more fashionable champagne-gold color. 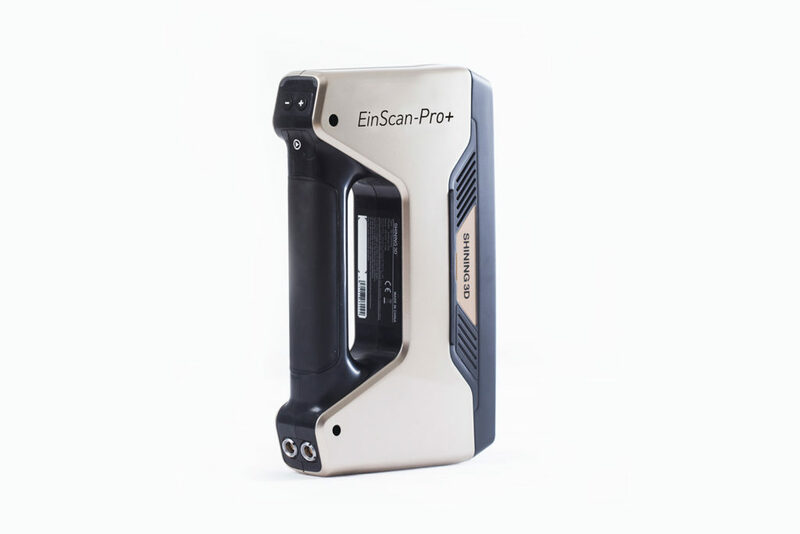 Although similar in appearance to the EinScan-Pro, it is full of new innovations. 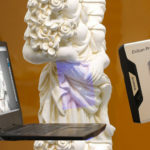 In the past, capturing 3D scanning details at high scanning speed could not be done simultaneously. 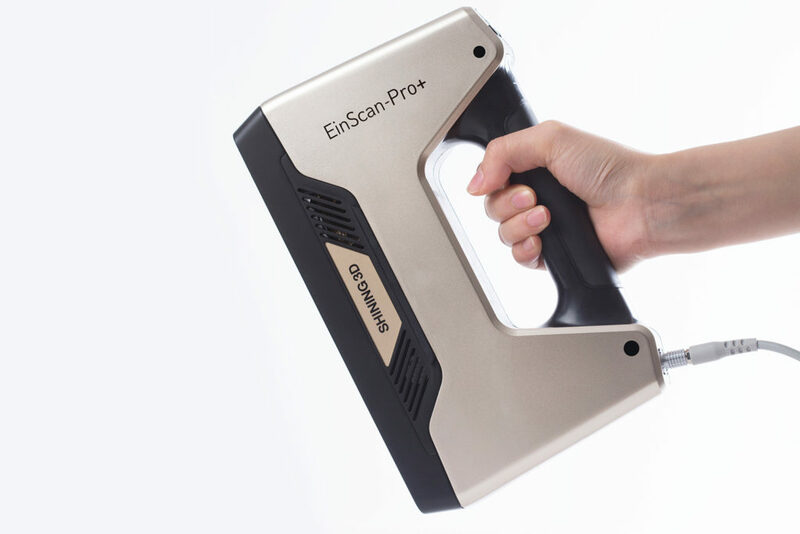 Now the EinScan-Pro+, equipped with a brand-new generation of handheld rapid HD scanning technology, protected by an international patent, offers an enhanced handheld HD scanning mode by implementing and using an intensive line-scanning strategy. The original 7 data capture lines have been increased to 100 lines. The scanning speed under the handheld HD mode has been increased to 550,000 points/second. The data acquisition speed in seconds, has been increased 7.6 times, to perfectly combine scanning speed and the acquisition of details. 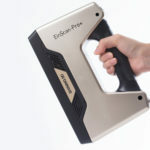 R² (Rapid Registration) scanning module is a newly-added module in the handheld rapid scanning mode of the EinScan-Pro. A new feature to recognize and align reference points has been added. 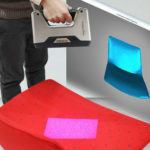 Since it is targeted to be used with large-size objects, with few geometrical characteristics, even flat objects without any geometrical characteristics can easily be scanned. Color information of the surfaces of objects can also be obtained. 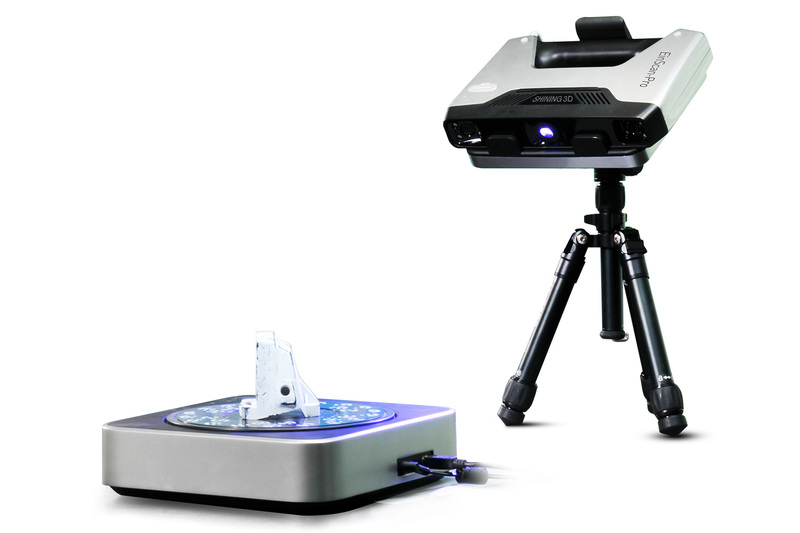 It delivers a rapid and smooth operating experience while ensuring scanning accuracy. This module is an optional paid module which needs to be activated after the purchasing of a license. 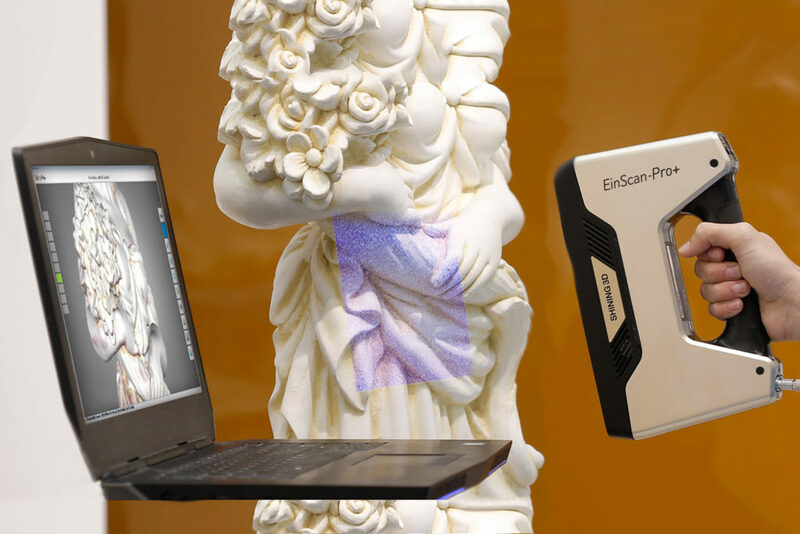 The major highlights of the EinScan Version 2.0 Software include an improved user experience, enhanced user-friendliness of the software interface, one-click data upload to the “Sketchfab” platform, and streamlined process to share scanned 3D data directly over the Internet. EinScan V2.0 also includes multiple new and upgraded functions. Closely following the trend of fashion, the appearance of new the EinScan-Pro+ is exquisitely finished in a champagne-gold color, offering a delicate and profound metallic texture. 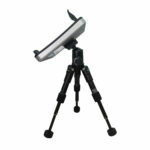 Physical dimensions: 248 x 156 x 48mm (9.76 x 6.14 x1.89 in); Weight: 0.8 Kg (1.76lbs). Die richtigen Einstellungen für Ihren perfekten 3D-Scan! 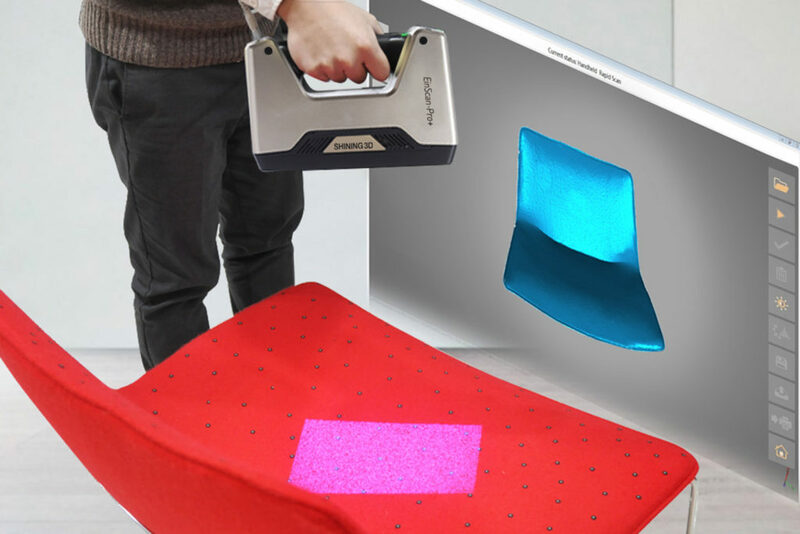 For a transparent, reflective or dark object, please powder spray prior to scanning. Processor: I5 or higher, Memory Storage: 8G or more.